I have a 5 year old gelding who has good feet and overall good conformation. I have had him a year and he has been barefoot for the last 2 months. I decided to go down the barefoot route because he is young, still growing and I want him to experience optimum health and wellbeing. He has made an excellent start and is coping well. I have resumed general riding although I let him choose his route over stony terrain. At the moment I haven't needed to fit boots. So far, so good. I am still quite inexperienced in barefoot matters so I have a podiatrist but eventually I would like to trim him myself. Hi Lisa, thanks for letting us know about your experience of going barefoot so far. If your horse is unhappy on stony tracks, you would probably find that he would be a lot more comfortable all round with the protection of hoof boots. Although he is going sound on softer surfaces, he may still be landing toe-first to protect the more sensitive parts of his foot - you could take a video and look at the way he's landing to find out. I know it might seem like putting boots on every time you ride is a big hassle at first (we felt the same way to begin with, and resisted using boots for a long time) but it's actually very easy once you get used to it, and the difference in how comfortable the horse feels is so worth it - it's great not to have to worry any more about avoiding stony surfaces. 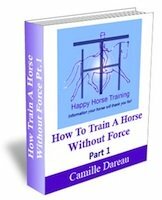 Have a look at www.happy-horse-training/hoof-boots.html for more info. Learning to trim your own horse's feet is also a great liberation. It means you can do it as often as you like (better both for you and your horse) and its a great feeling of satisfaction to be able to look after your horse's feet in this way. 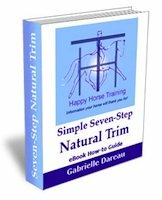 The method we have found to be by far the most successful for healthy feet is also the simplest to perform, see: www.happy-horse-training/natural-trim-ebook.html. 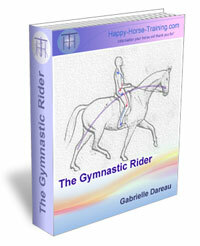 Good luck with your horse, and well done for making the right choice for your horse's health by going barefoot!